The Texas Rangers of old are gone. Gone are the days of the Arlington ballpark being a launching pad for hitters — Rangers and opponents, alike. 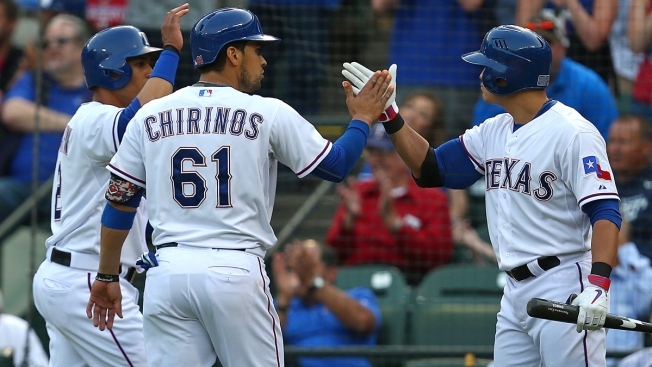 Due to some renovations, the power numbers in Arlington have taken a dip in recent years. Last season, because of those factors and a weak lineup, the Rangers' power numbers at home were the lowest they'd been in ages. So far this year, it was basically more of the same. Then came Monday's game against the defending AL champion Royals. Adrian Beltre homered in his second straight game, cranking career homer No. 399 on a frozen rope to right-center field. Then, call-up Thomas Field got in on the fun with a blast to the visitor bullpen, setting off the fireworks yet again. In the eighth inning, Prince Fielder hit his third homer of the year — a rocket to dead center. It was a big night for homers at Globe Life, and it came on a chilly night which had temperatures in the 60s by game's end. If the bats are going right now, imagine what they might be doing when temps get into the 90s and the ball really starts flying. It could be fun.